Parents the world over are notorious for encouraging their families to eat their greens, the benefits of which seem very well known at this point; but what about the other colours of the rainbow in the produce family? Brightly coloured fruits and vegetables often give us clues about their nutritional value. Although some colourless foods (think: cauliflower and mushrooms) have many health benefits, the colour is what often makes fruits and vegetables such nutritional powerhouses. 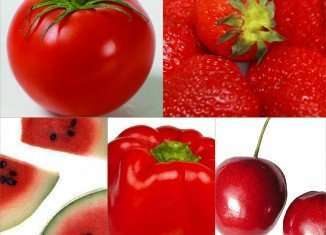 The pigment in these foods is created by various phytochemicals, such as antioxidants like lycopene and anthocyanins and may be helpful in preventing chronic diseases such as cancer, heart disease and diabetes. With Valentine’s Day only days, it seems pink and red is all around! So in keeping with the spirit of February 14th, we have chosen to feature some fruits and veggies that are as tasty and nutritious, as they are festive! Strawberries are full of heart healthy nutrients including folate, vitamin C and potassium, a key nutrient in improving blood pressure. They also contain a variety of phytochemicals which have anti-cancer, anti-inflammatory and cardio- protective properties. Raspberries have been found to be one of the top 50 foods containing the most antioxidants per serving. Raspberries contain antioxidants called anthocyanins and lutein, promoting both cancer prevention and eye health. Like strawberries, these tiny berries also pack a punch when it comes to vitamins and minerals as they are full of vitamin C, folate and potassium. Cherries also contain anthocyanins, vitamin A, C and potassium all while providing quite a bit of fibre per serving. Watermelon is often underestimated considering its high water content. Watermelon is 90% water but it is still chock full of nutrients. This refreshing melon contains lycopene, which has been linked to prevention of prostate and other cancers. Having gained much popularity in recent years, pomegranate arils (seeds) and juice are thought to be full of antioxidants and polyphenols which have been shown to be cardio-protective and cancer fighting. This fruit is also high in potassium, vitamin C, niacin and fibre. Cranberries are well known for their action in preventing urinary tract infections. This is due to their tannin content which helps to prevent bacteria from attaching to cells. This tart citrus contains vitamin C and lycopene and has been linked to the reduced risk of prostate, lung and stomach cancers. Earthy beets are a great choice to add to your dinner plate, not only are they colourful and lend an earthy note to any dish, beets are full of antioxidants with cancer fighting and anti inflammatory action. Beets are also high in fibre, folate and vitamin K. But the good news doesn’t stop there; beets contain betaine, which is considered to have anti-aging properties by protecting cells from damage. Red peppers are very similar to their other bell pepper counterparts but are left on the plant to ripen longer. Red peppers have more vitamin C and vitamin A than other colours of bell peppers and also contain small amounts of calcium, iron, and B vitamins such as thiamine, riboflavin and niacin. Tomatoes, although technically a red fruit, are often prepared as a vegetable. Tomatoes are often underestimated but are one of the best sources of lycopene there is. Studies have shown that the lycopene content in tomatoes is a great antioxidant with cancer fighting potential and may protect against prostate, pancreatic, breast and colorectal cancer. An interesting fact about tomatoes and lycopene, heat promotes better absorption of lycopene, so including cooked tomato dishes in your meals can lead to cancer prevention. Compared to its popular and green counterpart, red cabbage contains more vitamin A, C and iron. Like many other red fruit and vegetables, red cabbage also contains anthocyanins, therefore, may play a role in cancer prevention and reduces the risk of heart disease. There are numerous ways to include red and pink fruit and vegetables in your family’s daily diet and reap all the benefits these foods have to offer. So this Valentine’s Day, think of some creative and healthy ways to add a little more colour to your plate!